It will minimize the amount of wrist hinge and manipulation from the hands and wrists during the putting stroke. It will allow you to line up your body correctly. With a proper grip, the forearms are aligned parallel with the hips, shoulders, and feet, which improves the consistency of your putting. The main feature of the putting grip is that you allow the shaft to run through the palms, instead of down in your fingers. With a normal full swing grip, the club runs down the fingers of both the right and left hands. Running the club down the fingers allows you to hinge the wrist during the swing and get a lot of extra power and speed into the club head. We obviously don't need power and speed in putting, so we grip the club in a different way. If you look at your palm you'll see it's crossed by a "life line" that starts at the front of your wrist, between the two pads on the heel of your hand. This is where you want to put the grip - or more specifically the corner of the grip - on both hands. Let's look at the left hand first. Place your left hand on the grip where that life line is, right on the corner, then close your fingers. You'll find that you're pressing the grip against your hand with just the fingertips. Your fingertips should feel like they're pushing the club toward the palm of your hand. There may even be a slight gap between the fingers and the bottom of the grip. If you have a larger grip you may not have a gap - it really doesn't make much difference either way. You don't need to get a strong grip with your fingers because you're not trying to get a lot of power into your swing. Putting is about consistency, not force. It should feel like your fingers are pushing the club into the palm of your hand. The life line is lined up directly on the corner of the putting grip. As you put your thumb on the grip you'll notice that it's at a little bit of an angle; that's fine. You don't actually want the thumb running straight down the top of the grip. In order to get your thumb to run straight down the grip you would have to shift the whole club down more into your fingers and that's not what you're looking for at all. You want to keep it out of the fingers and more in the palm. The club should be on the same line as your arm. If you were to slide the club up through your left hand, the shaft would run right along your forearm. Seen from down the line, your grip with the left hand should form one single, consistent line from the elbow pit all the way down to the club head. Maintaining that straight line will help you get a lot more consistency with your putting stroke. When you add the right hand onto the grip you're going to do the exact same thing as the left. Line up the life line of your right hand with the corner of the right side of the grip. The best way to do this is to take your left index finger off the grip for a minute. Find the bottom of the life line on your right hand, between the two pads on the heel of the hand. Place that spot on the last knuckle on the middle finger on your left hand, as shown in the photo. Once you fit your hands together in this way, allow the other fingers of your right hand to grip the club under the left index finger. Allowing the left index finger to overlap the fingers of the right hand is called a reverse overlap grip. Rotary Swing Instructor Clay Ballard likes this grip because he feels that it provides some additional consistency in his stroke and helps keep the hands working as a unit. You can use either the reverse overlap or a normal grip; it's just a matter of preference. If you set up your grip with both hands and then take the left hand off, you'll notice that the right hand position is essentially the same as the left. Your fingers are pushing the club into the palm, the corner of the grip is running up the life line, and the grip itself is centered between the pads on the heel of the hand. Once again, if you slide the club up through your hand you will find that it runs right along your right forearm. When you put both hands together, you'll notice that the thumb on the right hand is at a bit of an angle, just as the left thumb was. That's just fine because, again, to get it straight down the shaft you would have to grip the club much more in your fingers and you would get too much hinge. Just as you did with the left hand, when you take your address posture you should be able to draw one straight line from the tip of the elbow all the way down to the club head. If you were to rest a club across your two forearms, it would be parallel to your feet, hips, and shoulders. Everything is lined up very consistently at address. As you stroke back and through everything will want to work down the same line. Pay particular attention to your grip. Make sure your hands and forearms are aligned correctly, and it will really increase the consistency of your putting stroke. 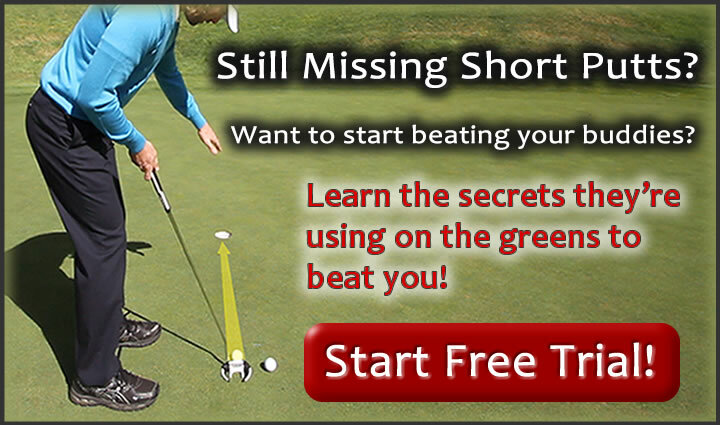 Get Your Free Membership to Watch "Golf Putting Grip" Right Now!